Meh Geek Squad was no help! I've been having issues with my laptop that gradually got worse, making everything run super slow or not working at all. Firefox kept on crashing and eventually stopped working altogether. I've been getting persistent script errors and computer shutting down every 10 minutes or so. Took it to the nearest Geek Squad and I was told everything was fine except for the fan, which is causing the laptop to overheat and shut down automatically in order to cool down. So they sold me a cooling pad and promised that it would solve everything. I do take care of all the regular maintenance that is required to keep the computer running properly...defrag, deleting Internet files, virus scan, Windows updates, etc...so what could be the problem? After countless hours of running the full service scan, I got a report stating that there were about 1500 unnecessary/orphaned/misplaced files clogging up the registry, causing the computer to run slow and programs not running properly, so they had to be deleted to fix the problems. Now it's running like a lean mean super fast machine again! I would highly recommend it even if you're not having computer issues as serious as I was having. So the folks at Facebook adamantly deny involvement in Fouad Mourtada's arrest, but are they telling the truth? Their contradicting statements suggest otherwise. The Moroccan authorities hacked into your database to obtain information about Fouad Mourtada. Is this really what you want us to believe? Well, I personally find that hard to believe. INTERNATIONAL DAY OF SOLIDARITY: FREE FOUAD! 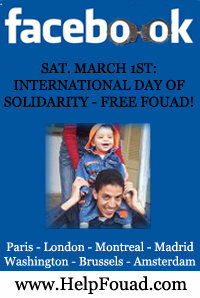 SATURDAY MARCH 1ST: INTERNATIONAL DAY OF SOLIDARITY: FREE FOUAD!! Saturday March 1st: 14:00 your local time. The verdict is out: A giant leap backwards for you Morocco, I hope you're happy with yourself! I am a second generation Moroccan-Dutch citizen, and I am a traditionalist. I've always been proud of my Moroccan roots and I've always respected Morocco's constitutional monarchy as an integral part of our national unity and a great source of pride, and held it in high regard. This is the first time in my life that I can honestly say, that sense of pride has been diminished. I feel only sadness and loss of hope with regards to Morocco. This blog is on strike in solidarity with Fouad Mourtada and his family. Morocco please, I beg you to do the right thing. Free Fouad, he clearly meant no harm. He may have broken a royal policy rule, which may call for reprimand, but for goodness sakes he doesn't deserve to be treated like a criminal. There are on Facebook 41 Nicolas Sarkozy, 10 prince William of England, Many Jackes Chirac (Former France president), Roger Federer, Georges Bush, Osama Benladen and so on. Fouad Mourtada, 26 years old IT engineer, was arrested and imprisoned in Casablanca, Morocco, on Tuesday February 05 2008, for creating a fake profile on Facebook of his royal highness Prince Moulay Rachid, brother of the king Mohamed VI of Morocco. This is a premiere in the world; there has never been such prosecution anywhere in the world. Fouad's initiative was a pure innocent act without any personal gain or harmful intent. Since Facebook Launch on 2004, a big number of young adults in many countries profile public figures and stars on Facebook for reasons of admiration or entertainment, without malicious intent. The purpose of this group is to help Fouad. With your support, there will be a public opinion on this case. Please ask as many friends as possible to join. We ask the Moroccan authorities to release FOUAD. To sign our petition for freeing FOUAD, please visit There are on Facebook 41 Nicolas Sarkozy, 10 prince William of England, Many Jackes Chirac (Former France president), Roger Federer, Georges Bush, Osama Benladen and so on. Madeleine McCann was Abducted in Portugal on May 3rd. Have you seen her? Madeleine was possibly last seen in Morocco. 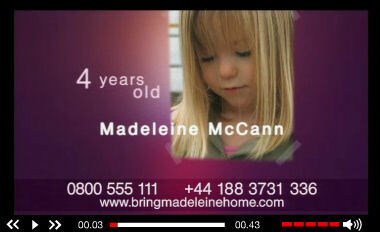 If you have any information on the whereabouts of Madeleine McCann please call the police immediately. Please extend this appeal notice throughout the blogging community and reach as many people as possible.